Spinning out of the cataclysmic events of Dark Nights: Metal and JUSTICE LEAGUE: NO JUSTICE, the core members of the Justice League-Superman, Batman, Wonder Woman, Aquaman, the Flash and more-are reunited in all-new adventures! The League was forced to make an impossible decision...and now it's time to face the consequences! 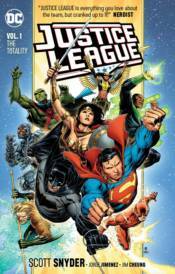 The returning Martian Manhunter struggles to protect the team from an incoming threat that will shatter the world as they know it, while a familiar face strikes out on a dark path...This new title collects JUSTICE LEAGUE #1-7!